Test your campus knowledge this week on Facebook. TAMPA, Fla. -- Oct. 22 kicks of the week of Homecoming for the University of South Florida, and the College of Arts and Sciences is hosting a contest featuring our favorite bull! CAS will be posting pictures of Rocky in different places around campus and students, faculty, staff and alumni can win a homecoming prize by submitting their guess, once a day, on the College of Arts and Science’s Facebook page. 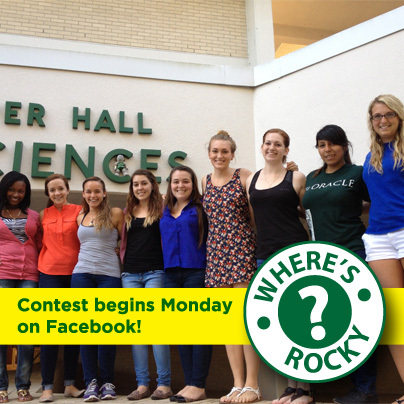 Each day during Homecoming Week, CAS will reveal a picture of Rocky in an obscure location on campus. To enter, fans need to submit their name and where they think he is hiding. The chance to enter will close by 11 p.m. on that day. The College of Arts and Sciences will award one point per correct answer every day. The contestant with the most points at the end of homecoming week will win a prize package, including various USF memorabilia such as a T-shirt, sunglasses, cup, pen, poster, etc. Make sure to enter once a day to be the winner! In case of a tie, the contestants in first place will be entered into a pool and the winner will be drawn at random. Lookout for Rocky’s picture; the contest begins today!